Ok, so we’re a bit off topic again, but I had a trip up north to Gold Coast for the Saturday and I decided to bring some fishing gear up with me. Note that to bring fishing gear on to a plane, you will have to put it in as checked-in baggage as they will consider your fishing gear as potential “weapons”. I brought a small collapsible rod with me and just wrapped it with a towel. As I was there for only a number of fishable hours, I decided to just bring some lures and soft plastics. I decided on fishing around Pizzey Park as described on the Gold Coast council page. I couldn’t seem to find the jetty at first, so I just went down to where there was water and fished off the bank. I decided to use a hard body lure, the much-hyped Ecogear SX40. I have had this lure for quite a while without much luck. 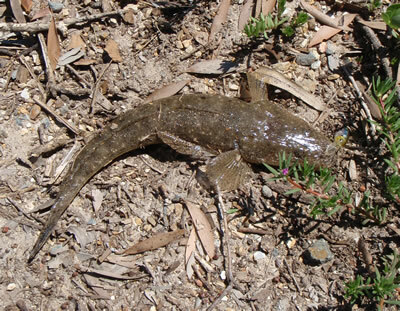 On about my fourth cast, I hit what I thought was some weed, but came in fighting, and ended up to be nice sized flathead at about the 35cm mark. Released safely back to the water, after a few more casts, I was on again! This time it was a bigger one! After a quick struggle, the fish managed to snap me off, an expensive loss of about $15+. Switched over to soft plastics, as that was my only hard body lure. Nothing for the rest of the day. I was not much of a fan of hard body lures, up until that day! If you ever get the chance, I would highly recommend bringing a rod to your next trip to the coast. There were plenty of spots to fish, and not many cars on the road either! The only issue I had was the weather, which seemed to be a drier hot than in Sydney.